One of the simplest yet unknown features for any viewer is the Theater Mode. Sure, you can always go full-screen, but the theater mode allows you to view your notifications while being completely immersed in the video stream. 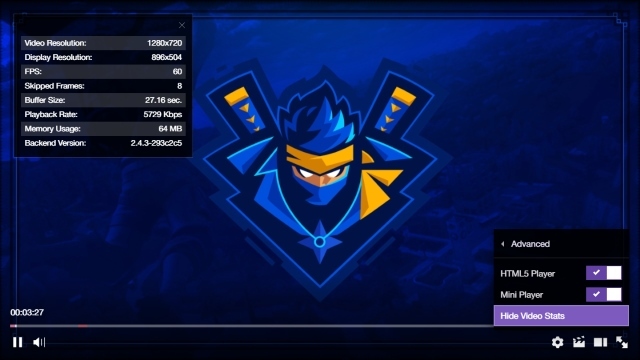 To do so, simply click the Theater Mode icon at the bottom right of the Twitch video player. 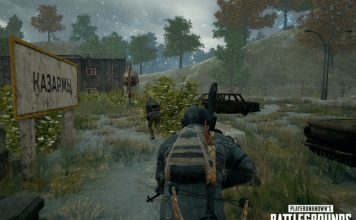 You will now get a bigger viewing area while still being able to see the chat, as well as a slick, black background that will help keep the focus on the action. So you’ve watched that entire gaming stream of your favorite streamer, but you wish to show a specific portion of it to your friends. Well, that’s where Clips comes in. 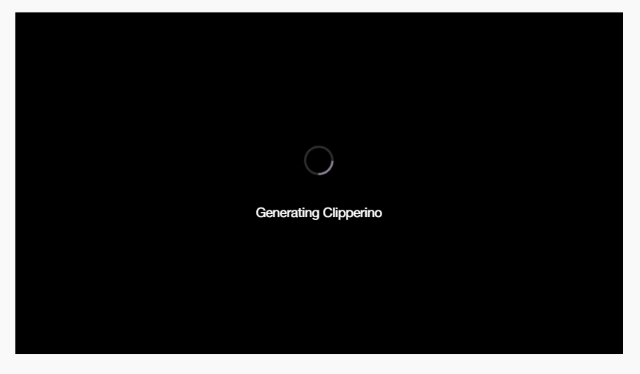 You can easily create a custom clip of the entire video stream. To do so, simply click the Clips icon at the bottom right of the video player, or press Alt + X on your keyboard. From there, you can rename your clip, edit it and easily share it to your social media platform of choice. Twitch offers a mobile app for its viewers as well, allowing you to watch streams and broadcasts while on-the-go. But imagine if you’re driving and wish to just listen to a specific stream? Well, that’s where the audio-only mode steps in. 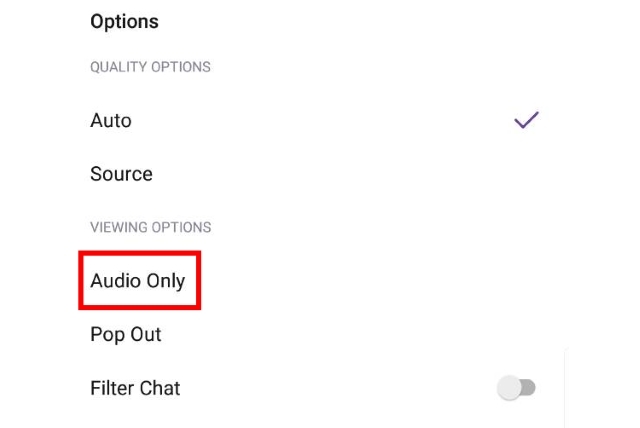 Once you have the Twitch mobile app on iOS or Android, simply fire up a stream, hit the settings icon and select Audio Only mode. You’ll now get to enjoy your favorite broadcast without wasting all your mobile data. Pulse is essentially Twitch’s built-in social network, allowing you to post status updates to your friends and followers, complete with images, video links, and funny emojis. To use Pulse, simply enter some text in the big Pulse field right on Twitch’s home page. Additionally, links from Twitch, YouTube, Imgur, Gfycat, and Vimeo are all supported. Are you one of those who loves to see every nerdy detail of the stream you’re watching? Well then, simply hit the settings icon, and select Advanced > Show Video Stats. You’ll get to see everything from the stream resolution and frame rate to how much memory the broadcast is eating up. You can tweak the quality of your stream simply by selecting Settings > Quality. Just because your favorite stream is now over doesn’t mean you can’t catch up afterward. 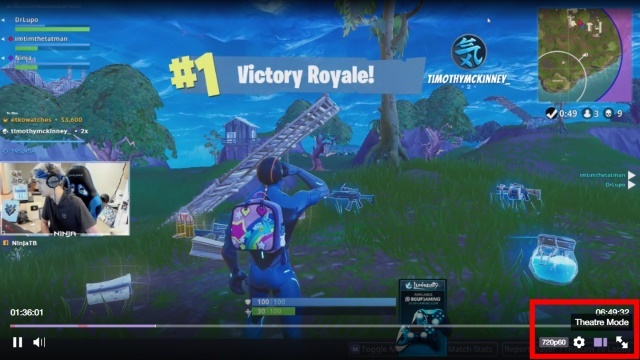 A streamer also saves his streams to allow his/her viewers to watch them later on. To watch archived broadcasts, go to your channel of choice, and select Videos. You’ll be able to watch anything that the streamer has archived. You’ll even get to see a replay of the chat room so you can see how fans reacted to big moments. Watching a low count of viewers on your stream can not only be distracting but de-motivating as well. There have been so many times when I’ve streamed to only a couple of my friends, and that viewer count has been so troublesome for me. 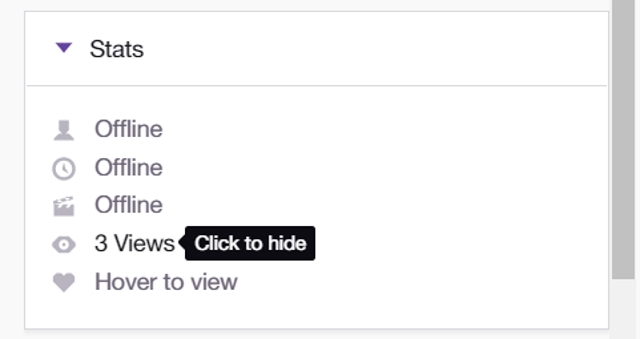 Thankfully, Twitch allows you to hide it easily. Just head over to your Dashboard and under the Stats section, click on the Views part to hide it. And that’s it. Hosting is a great way to keep your viewers entertained, even when you’re not streaming. To host a channel, go into your channel’s chat room, and type “/host” followed by the name of the channel you want to feature. 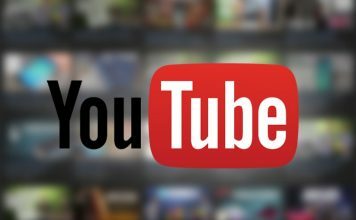 Alternatively, if you want to automatically host other channels whenever you’re offline, simply go to Settings > Channel & Videos and turn on Auto Hosting. Make sure you add some channels to your Host List so Twitch knows what to feature while you’re away. 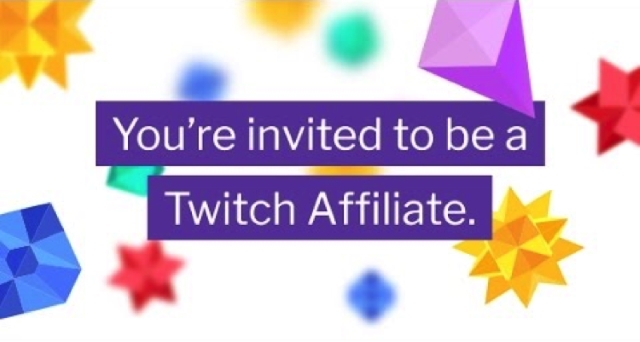 Thanks to the new Twitch Affiliate Program, you have a better shot than ever at making money off of your streams. To be eligible for the Affiliate Program, you need to have broadcast at least 500 total minutes across at least seven unique days within the past 30 days. If you qualify, you should get an email within a few weeks. You can check out the entire list of requirements here. You’ll also need an average of three concurrent viewers and at least 50 followers. 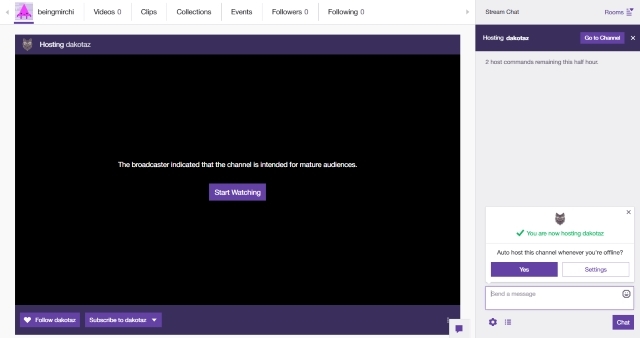 As a streamer, Twitch provides you with a ton of features to use and interact with your audience. However, you can use some extra third-party tools to further improve the experience. For instance, you can use KapChat to add Twitch chat to your stream. It features chat badges, username colors, emotes and real-time removing of messages. Or maybe you’ll fancy Animated Social Media Popup. This tool displays each social media site icon/name on screen for 10 seconds and loops the entire thing every 5 minutes. So you registered on Twitch with whatever name you could come up with and started using the service. But now you feel like changing your Twitch name. 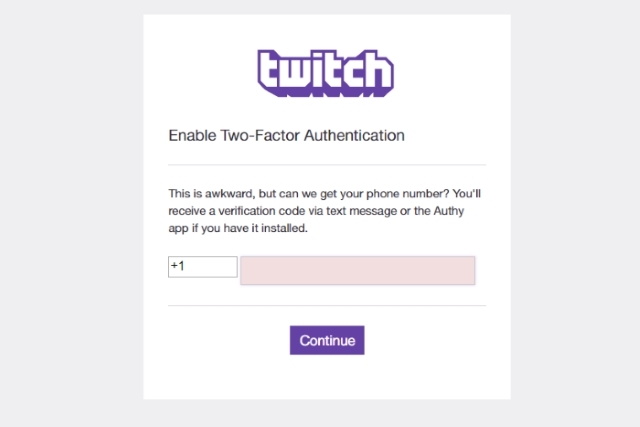 Well, you can change your username on Twitch as often as every 60 days. To do so, go to Settings, and select Edit next to the Username field. However, keep in mind that your broadcaster stats will reset every time you change your name, and your old channel URL won’t redirect to your new one. That being said, if you’re a Twitch Partner, changing your name won’t impact the revenue you make, and your old name won’t be recycled. That being said, you can change your Display Name whenever you like. The idea of streaming on Twitch is to earn some money along the way, right? 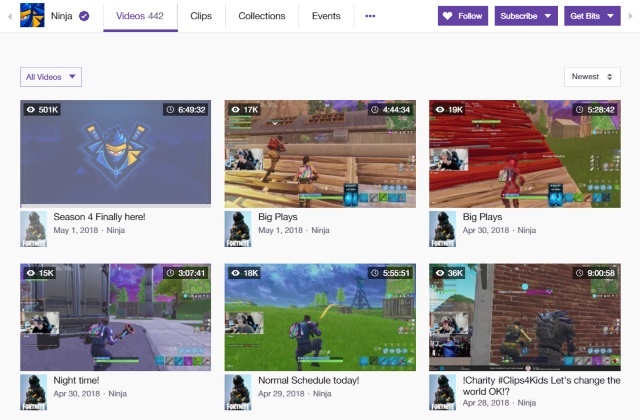 Well, Twitch recently announced a new capability to its ‘Extensions’ feature which will allow users to unlock specific parts of an extension by spending Bits, Twitch’s virtual currency. With the new feature, developers will be able to customize parts of their Extensions with interactive experiences. Viewers will be able to access these experiences in exchange for Bits. 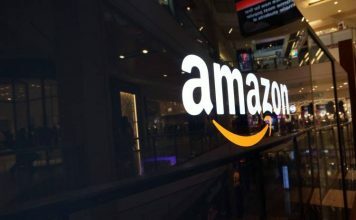 Additionally, 80 percent of the revenue generated by the Extensions will go to the streamers, considering the fact that they’re the ones driving traffic to the Extensions through their channel, with the rest going to the Extension’s developer. 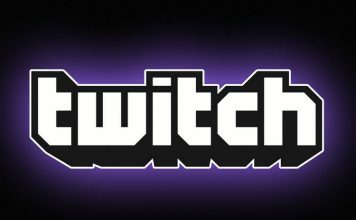 You can also read our article on how you’ll be able to generate revenue using Twitch Extensions. Well, that was all from our side. 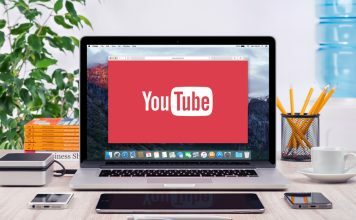 A lot of members of the Beebom team use Twitch daily, with some of us even streaming, and the above list of tips and tricks was curated with the help of each and everyone of us. That being said, do you know something that other users might not be aware of, and even we missed out on? Let us know in the comments down below.